I was supposed to post about my newest project regarding Buchi's Dog Rehabilitation. However, during my inspection of Chooey's face- eyes, ears, nose and mouth... a little growth on her mouth caught my eye. 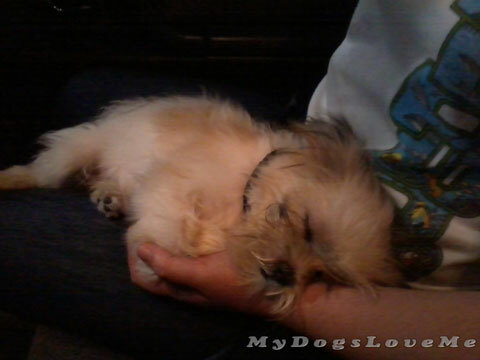 Before everything else, let me just share with you a picture of how Chooey acted during the entire trip home. After 2 nights and 2 days of re-potty training, socializing, grooming and setting them up comfortably in their new dog houses ( waking up at 5 AM, spending more than 4 hours with them and making sure they're all comfy and cozy at night), I discovered this. 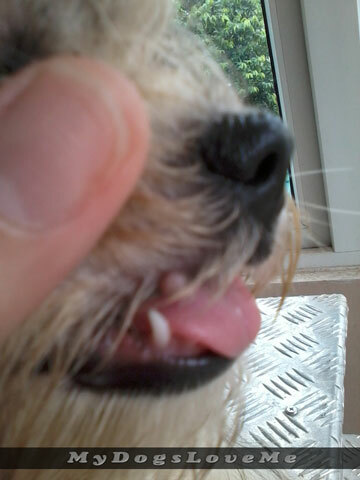 So I called my sister as we made a thorough inspection of Chooey's mouth and further found 4 more. I was surprised to have never noticed this before. We've just arrived and this is what I find out... It's as if they just popped out of nowhere. There were 2 inside her mouth and 3 small ones outside. I feel weak and powerless at the sight of these growths. So, I researched about them- praying it's just a minor irritation from the baking soda I've been using to deodorize the place (since Buchi isn't potty trained). But then I read about Epulis, a kind of oral tumor, and Canine Warts. We've decided to go to the vet a little later (next week) as I don't want to stress Chooey much. We just got here, for Dog's Sake! Chooey may have contracted canine warts, which I am still unable to comprehend where she got. I couldn't bear the fact that due to her immature immune system she picked this up. Worst, I have to stop her and Buchi from playing with each other because it's contagious. My sister told me not to worry too much but I'm just devastated. Oh, yuck. We hope they don't hurt. And we hope you don't mind if we send purrs that all will be okay! Those are very odd. 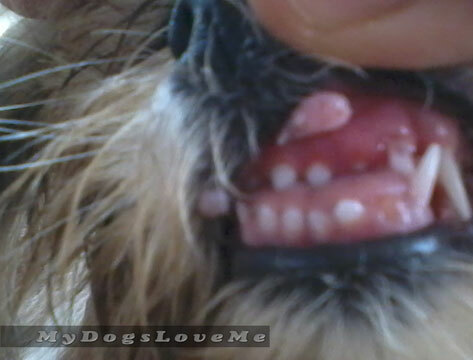 We have heard of warts on dogs, but never in the mouth. Maybe they are stress-related? Hope the vet finds them to be nothing too big. Hoping that there is nothing to worry about. Do keep us updated. Have a good Friday. Oh dears! We have our paws crossed for a good report from the vet. Keep us posted. Oh dear. We will pray for Chooey's healing. Please let us know what the vet says! We'll keep Chooey in our prayers. Is she otherwise okay? Eating, playing, litter habits? Let us know what the vet says. 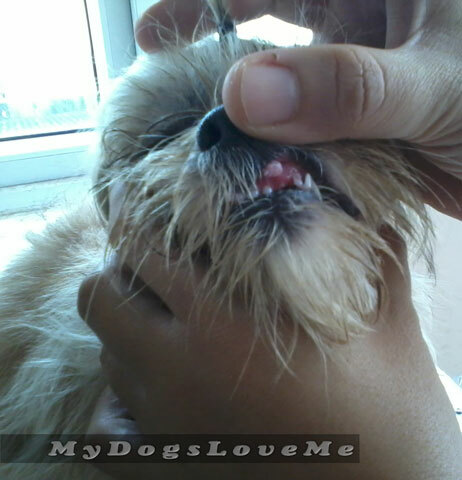 Our dog has a wart above his eye, vet said nothing to worry about....Hope chooey has a good outcome too! How strange. It must have been a shock to see them. Hope you manage to get them sorted out soon and they don't have to be removed or anything. We are sending our love Chooey! Poor Chooey! We sure hope that she will be okay. Please keep us posted, okay, Haopee? We had no idea such a thing existed. We hope Chooey is ok.
Poor puppy, hope it's not serious. Keep me updated. i know the stress you are going through! when rocket had that benign growth on his leg, i was stressing out for days waiting for the vet to call me! i haven't ever seen or heard of something like this, is there a certain condition that is exclusive to the breed? i know rocket will get schnauzer bumps on his back, they crust over and disappear. it's something only schnauzers get. yuki doesn't get them, but spartacus does. one time there were probably 50 all over his back and they got infected. he had to take antibiotics and shampooed with a medicated shampoo. Aww, poor Chooey. I hope it turns out to be nothing serious. Oh MOWZERS, we bet you're worried sick! Please let us know what the vet says!! Glad you like the Olympics updates, as far as winners, the cats are having true winners, Us guys in blogville decided that the best part was having fun!!! So sorry this issue just cropped up like that, but glad you found it before your other dog caught it (if it is contagious). :-( Hope you get some good news at the vet. Maybe it is easily treatable? Poor Chooey. I hope it's not to uncomfortable and the vet says it's nothing to worry about. I've got my paws crossed. I hope it turns out to be nothing serious….